Oh yes we did! We have combined the major food groups into one savory, smokey, beer bacon delight. 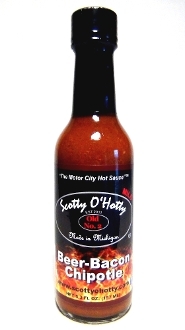 This delicious sauce is like no other sauce you have ever tasted. This mild sauce is rated "E" for everyone & taste tested by some of the best culinary experts in the country. We've been told "the BBC is the best bacon sauce in the universe!" We will let you be the judge of that! Due to high demand allow 2 weeks for delivery.